Please take action for Michigan’s wolves. 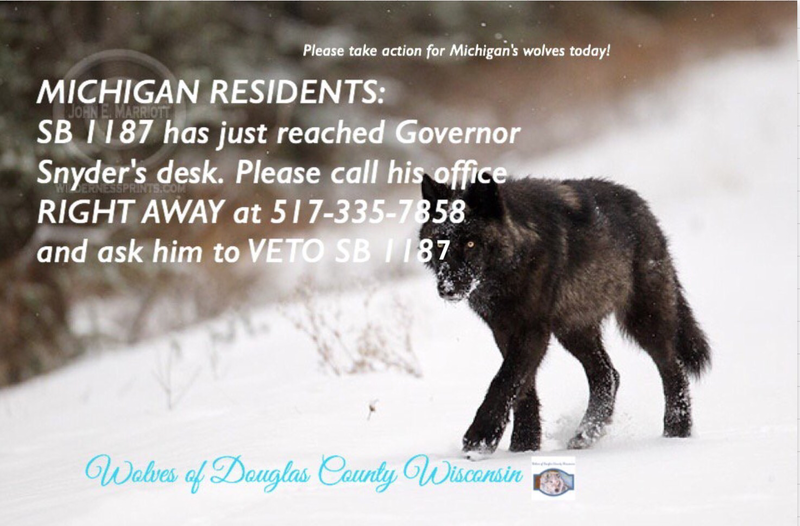 Call or tweet Michigan’s Governor ask him to Veto SB 1187.In the 2014 general election, Michigan voters soundly rejected two referendums on the trophy hunting and trapping of the state’s small population of wolves. But now, the Michigan legislature has rushed through another bill, SB 1187, to once again designate wolves as a game species to be hunted and trapped—in spite of that public rejection of an almost identical measure at the ballot box just two years ago. This bill is now on the desk of Michigan Governor Rick Snyder. Governor Snyder should veto SB 1187. Michigan citizens have stated in no uncertain terms that they do not support the recreational hunting and trapping of wolves. Your voice is needed now to protect Michigan’s wolves. Tweet at Governor Snyder using any of the pre-written messages, urging him to veto SB 1187. Click on one of the following messages, and you’ll automatically be sent to Twitter to send your tweet! Sadly, the governor ignored calls and letters signing that aweful bill into law Christmas Eve. Thank you for advocating for Michigan wolves! Catherine M. Neuhoff Ph.D.